Nina Renata Aron is a writer and editor based in Oakland, Calif. She is a features editor at Full Stop and senior editor at Timeline. Find her online at @black_metallic. This book, like all of Tea's best writing, bristles with life and a fierce intellect. Her voice is as distinct as ever, and her ability to conjure something—an album cover, the feeling of a hangover—in just a few phrases, like Zorro (zip, zip, zip!) is still wonderfully intact. Rick Snyder is, for the time being, Governor of Michigan. He is also one of the handful of heroes in a tale teeming with villains, Detroit Resurrected: To Bankruptcy and Back, a richly reported and important new book by Nathan Bomey, who covered America’s largest municipal bankruptcy for the Detroit Free Press. Snyder proudly calls himself “one tough nerd.” He’s an accountant by training, a businessman and venture capitalist, a rich Republican technocrat who had zero political experience and open disdain for the workings of government when he decided to run for governor in 2010. Snyder portrayed himself, according to Bomey, as a “job creator” and “the consummate outsider with the business sensibility to rehabilitate Michigan’s economy.” Rich Republican outsider with zero political experience and open disdain for government claims he has the business acumen to make [fill in the blank] great again — sound familiar? Snyder won the election in a blowout, and one of the first things he did when he got into office was to push a piece of legislation that had huge implications for the battered, teetering city of Detroit. Snyder convinced the Republican-controlled state legislature to give state-appointed emergency managers the power to usurp the authority of locally elected officials, including the power to revoke union contracts, suspend collective bargaining, control budgets, and sell assets. It was, in essence, the power to suspend democracy. Snyder also deepened already severe cuts in state aid to cities, and he signed a right-to-work bill that made it illegal in union-friendly Michigan to require anyone to join a union as a condition of employment. The other shoe dropped in March 2013, when Snyder introduced Kevyn Orr as his choice to become Detroit’s emergency manager, a likely prelude to a Chapter 9 bankruptcy filing. Orr is a self-proclaimed “yellow-dog Democrat,” in many ways Snyder’s opposite. But he is also a battle-hardened bankruptcy negotiator who had helped save Big Three automaker Chrysler by mercilessly shuttering dealerships and cutting jobs, then leveraging a government bailout. In a city that’s more than 80 percent black — and historically distrustful of white takeover attempts — the fact that Orr is black was no small consideration. By the time Orr hit town, Detroit was in free fall. Half a century of population decline, lost manufacturing jobs, a shrinking tax base — coupled with corruption, mismanagement, and a harrowing crime rate — meant the city was broke and broken, with no way to pay its mountainous debts or provide the most basic services. The city was taking in $1 billion a year in revenue — and it owed three times that amount to pensioners. Bomey does a superb job of laying out the origins and depths of Detroit’s fiscal and political woes. He has done prodigious research into archives and court documents, interviewed all the players, and woven a tangled mass of facts into a narrative that reads like a thriller. Other heroes emerge from his narrative. One is Judge Steven Rhodes, who handled the bankruptcy case in a manner that was both tough and fair; another is federal Judge Gerald Rosen, who served as mediator in the bare-knuckled negotiations over pension cuts, debt reductions, and union contracts. Rosen’s most ingenious contribution to the case was conceiving what came to be known as the Grand Bargain — nearly $1 billion in pledges from philanthropic organizations, private citizens, and state government that permanently shields the Detroit Institute of Art’s cherished collection from creditors. While it can be argued that Kevyn Orr’s deft handling of the emergency manager’s duties was crucial to turning Detroit around, emergency managers in another blighted, post-industrial, predominantly black Michigan city have not fared as well. The relatively sunny Detroit Resurrected is crying out for a dark sequel. It should be called Flint Contaminated, and I nominate dogged Nathan Bomey to write it. It’s now been revealed that in an effort to slash costs, emergency managers in Flint made a disastrous mistake in 2014: they stopped buying water from the Detroit system and began pumping water from the Flint River, despite publicized safety concerns. Then, inadequate treatment of the river water caused lead from water lines to leach into the city’s drinking water, poisoning an unknowable number of residents. General Motors stopped using Flint city water in its factories because the water was ruining engine parts. Though Snyder, the hands-off technocrat, was alerted to the potential hazard in October 2014, nearly a year passed before he acknowledged the seriousness of the threat to public health. This was an astonishingly swift fall for a man who was perceived as one of the heroes of Detroit’s bankruptcy. Though term limits will prevent Snyder from running for re-election in 2018, two petitions are now circulating in Michigan to put his recall to a statewide vote on this November’s ballot. The governor has become the poster boy for everything that can go wrong when voters elect an outsider with no political experience and open disdain for the gritty negotiation and hands-on oversight that are the essence of running a government. Detroit’s resurrection notwithstanding, Snyder’s botched handling of the Flint water poisoning crisis should serve as a cautionary tale to Donald Trump and his growing army of supporters: be careful what you wish for. As events in Michigan have shown, the triumph of a political outsider does not always play out happily. 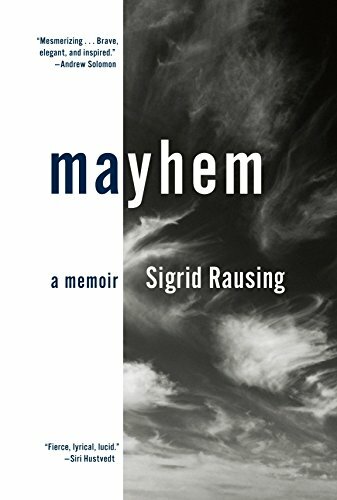 Wow, I’m speakless(which is rare)and so deeply moved by Nina Renata Aron’s review of Mayhem. I’m searching for the right words to her review that would do it justice. I’m humbled as a published author in the recovery field. Thank you Nina for touching a place in my heart in which you speak delicately and powerful.